What is an eatigo cash voucher? 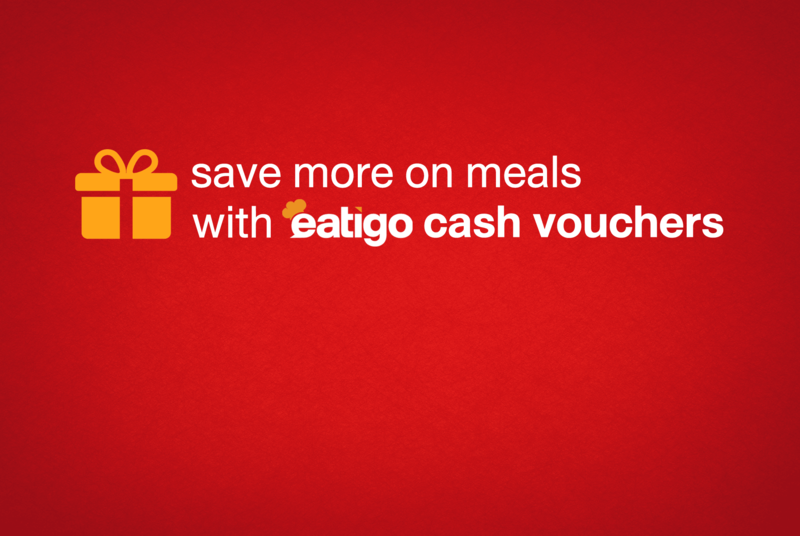 Eatigo cash voucher is a cash discount that is applied to your final bill, on top of the original eatigo discount. To redeem, you just need to insert an eatigo cash voucher promo code when you make a reservation, and the discount will be subtracted to your bill automatically at restaurants! Q: Will I still get my original eatigo discount if I apply the eatigo cash voucher code? A: Yes you will. The eatigo cash voucher will be an on top value discount to your original eatigo Discount. Bill totals to $50 after eatigo discount. And with your $10 eatigo cash voucher, the final amount you need to pay only $40! Q: Can eatigo cash voucher be used without an eatigo reservation? A: No. Eatigo cash voucher is only applicable for when you make a reservation via eatigo. Q: What is the difference between an eatigo cash voucher and other eatigo promotional codes? A: Eatigo cash voucher gives you an instant cash discount at our partnered restaurants while other types of promotional codes rewards may vary according to the terms of the promotion. Q: Can I use eatigo cash voucher on all restaurants? A: No. 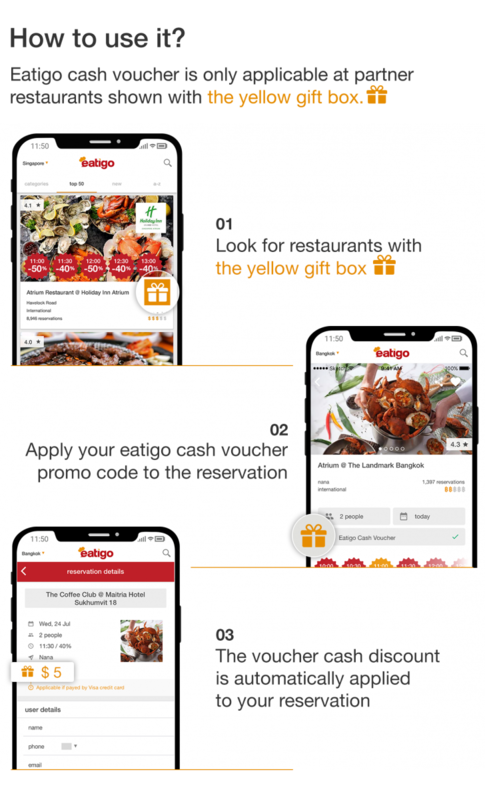 Eatigo cash voucher is only applicable to partner restaurants which are presented on the app and web with the “yellow gift box icon”. Eatigo cash voucher may not be exchanged for cash. The eatigo cash voucher can only be used as a fixed value discount on top of the total eatigo reservation bill. Eatigo cash voucher can only be used at restaurant merchants that have agreed to accept eatigo cash voucher. Restaurants that do not accept eatigo cash voucher will not be reservable with the eatigo cash voucher promo code. Eatigo cash voucher is considered used and is non-refundable if the promo code has been applied and the customer did not show up at the restaurant. Restaurant will not provide cash refunds when the eatigo cash voucher amount is more than the restaurant bill. Eatigo cash voucher may have special conditions required for the customer prior to payment i.e. certain payment type or membership identification proof. Restaurant partners reserves the right to validate and reject the eatigo cash voucher if conditions are not met. Similar to the standard eatigo discount, eatigo cash voucher do not stack on top of any other restaurant promotions or 3rd party promotions. Eatigo reserves the right to amend and terminate the eatigo cash voucher program at any time.